Join thousands of volunteers in the fight against hunger! Your generosity allows us to help more families in need in Nebraska and western Iowa. In FY 2017, volunteers donated 51,000 hours of service at the Food Bank! This is equivalent to 21 full-time employees! Our volunteer hours are listed below. Volunteers of all abilities are welcome. Group sizes range from 3 to 50 people. Volunteers must be at least 16 years old, ages 12-15 may volunteer with adult supervision. We do not accept court-ordered community service or individuals in the diversion program. Tuesday – Friday: 9:00 a.m. – 11:30 a.m.
Tuesday Evening: 5:00 p.m. – 7:00 p.m.
Saturday: 9:00 a.m. – 11:30 a.m. 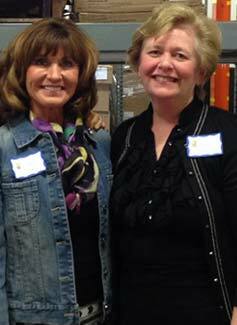 If you have questions, please contact our volunteer coordinator at Volunteer@FoodBankHeartland.org or 402.331.1213. STEP 1: Complete the individual or group application. STEP 2: Once a volunteer coordinator has completed your application, login to the volunteer portal to schedule volunteer hours. Food Bank for the Heartland Friends, “the Foodies,” is an organization dedicated to the support of Food Bank for the Heartland through volunteerism, fundraising and the promotion of community awareness. Membership in the Foodies offers volunteer opportunities, a connection with other community volunteers, and involvement in Food Bank special events. Currently there are more than 200 members. If you are interested in joining the Foodies, please complete the form below.